A first half hat-trick from pacy right winger Kwaku Asiedu and tries from his back three colleagues Louis Roach and James Neal plus scrum half Will Flinn saw Coventry Development to a hard-earned 34-10 win over British Army A.
Cov took an early lead when some good continuity and neat handling freed the long-striding Asiedu who rounded his opposite man and went to the corner for a try which fly half Dan Lewis improved. 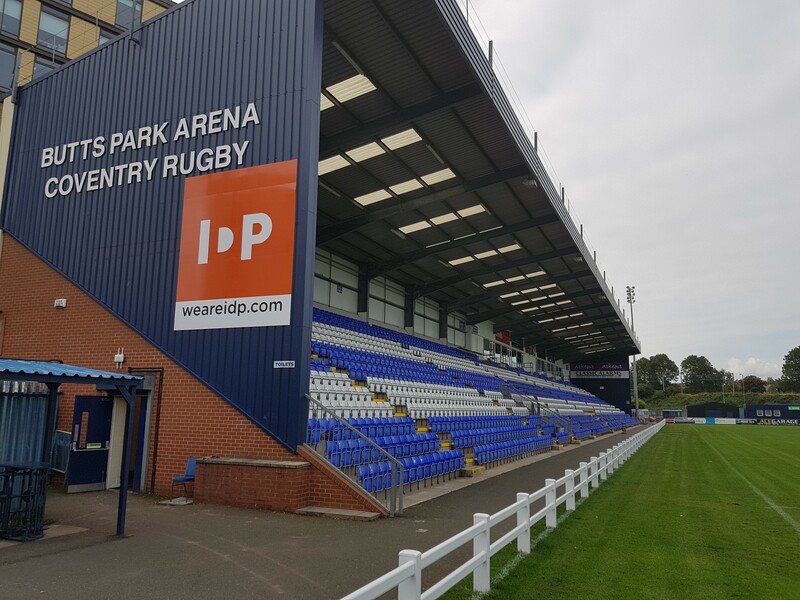 And after Army No.10 Steff Wilson kicked a simple penalty, Cov’s pacy right winger claimed a second converted try – this time with an impressive finish from 40 metres after the home backs defied the difficult conditions with some excellent swift handling. The visitors’ forwards carried strongly at times, but were met by solid home tackling which included one notable bone-crunching effort from fit-again Sam Tuitupou. And the former All Black soon showed he has also lost none of his attacking verve by breaking down the left to set up the position from which Asiedu completed a 30-minute hat-trick when he easily won the race to Jack Ram’s chip ahead on the opposite side of the field. Tuitupou then created Cov’s fourth score, which was finished by left winger Roach after a neat handling interchange with Flinn. And the home side’s No.9 then got on the board himself when he took full advantage of a large blindside to dart over from a scrum and leave the Blue-and-Whites with a 29-3 interval advantage. The third quarter largely took place between the two 22-metre lines as both sides struggled to overcome the conditions and multiple changes. But when referee Carl Adams sent Cov replacement prop Jack Higgins to the sinbin after previously issuing the hosts with a warning regarding their high penalty count, visiting winger Nawari struck a blow for the Army by sliding to the corner for a try which was well converted by Lewis. Uncontested scrums followed, but just as Higgins was about to return Freddie Betteridge tapped a penalty quickly and made ground into the Army 22 before sending James Neal over with a sublime out-the-back offload. Coventry Development XV: Povey; Asiedu, I.McNulty, Tuitupou, Roach; Lewis, Flinn; Titchard-Jones, Herbert, Brighouse; Russell, Gray; Waring (Guest), Betteridge, Ram. Replacements: Robinson (Guest), Tin, Higgins, Hales (Guest), Strath, Southwell, Palmer, Titchener, Neal. British Army A: Whittington; Woodhouse, Nawari, Mercer, Matacagi; Wilson, Chennel; Bowden, Farrow, Roberts; Kabi, Heath; Batterbury, Smart, Matai. Replacements: Frere, Dwyer, Westwood, Vereti, Butler, Coombes, Lewis. 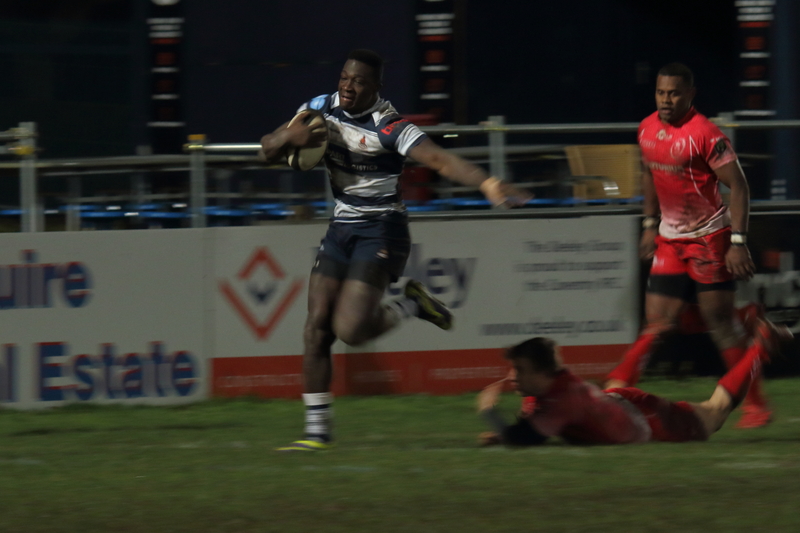 Posted in Match Reports, News and tagged British Army, Butts Park Arena, Coventry Rugby.